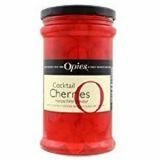 Large 950g jar of Opies red maraschino liquor flavoured cherries - with stems. Opies cocktail cherries are used by bartenders, mixologists and chefs around the world to add the final flourish to cocktails and desserts. Flavoured with alcohol-free maraschino flavouring. Maraschino is an Italian liquor created by distilling Marasca cherries. 950g of cherries in flavoured syrup. 500g of cherries by drained weight. Cherries (contain preservative: Sulphur Dioxide), sugar, water, Flavouring, Acidity Regulator: citric acid, Colour: Erythrosine. This product is made in a factory where the following allergens are handled: Walnuts, mustard, dairy, sulphites, celery and soya.